How Big Is Peru in Comparison to Other Countries? The home of the famed Machu Picchu, Peru is grand in a variety of factors, from the number of stunning mountain vistas and the warmth of the people to just overall size. Peru is the 20th largest country in the world, with a total area of approximately 496,224 square miles (1,285,216 square kilometers). Water bodies that are within the country borders like lakes and rivers account for approximately 2000 square miles (5,200 square kilometers). Crossing the width of the country horizontally takes 306 square miles (493 square kilometers) starting in the town of Trujillo and ending in Pucallpa. Traversing Peru by vertical length is 975 miles (1570 square kilometers). beginning from Ilo and finishing in Iquitos. The highest point in Peru is the southern summit of Mount Huascarán of the Andes which rises 22,205 feet (6,768 meters) above sea level. The country, with a population of 32 million people, is divided into 1 province, Lima, and has 25 regions that include Amazonas, Ancash, Apurimac, Arequipa, Ayacucho, Cajamarca, Callao, Cuzco, Huancavelica, Huanuco, Ica, Junin, La Libertad, Lambayeque, Lima, Loreto, Madre de Dios, Moquegua, Pasco, Piura, Puno, San Martin, Tacna, Tumbes and Ucayali. By density, Peru is listed as the 191st out of 195 countries with 23 people per square kilometer (57 people per square mile). In comparison, the United States (the fourth-largest country in the world) has a total area of about 3.8 million square miles (9.8 million square kilometers). Compared to the United States, Peru is slightly smaller than Alaska but almost twice the size of Texas. 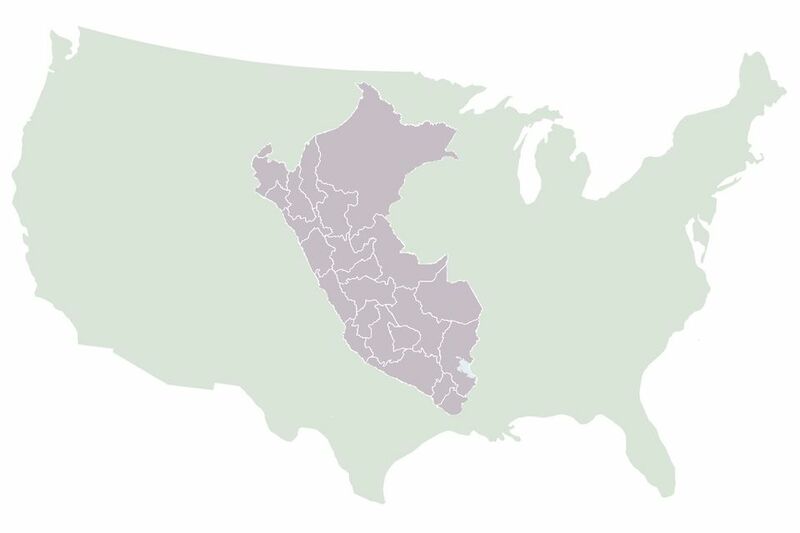 Peru is about three times the size of California and the state of New York would fit inside Peru about nine times. Outside of the United States, Peru is three times smaller than India, which clocks in at approximately 20,426,101 square miles (3,287,263 square kilometers) but is greater in size than France, Germany or Spain. Peru's population of 32 million makes it the fourth largest country in South America with only Brazil, (204.5 million), Columbia, (48.5 million), and Argentina, (43.1 million), hosting more within their borders. However, Peru cannot be considered to have a large population when pitted against the most populated countries in the world like China (1.4 billion), India (1.3 billion), the United States (325 million), and Indonesia (266 million). According to the World Atlas, Peru just breaks into the Top 20 in the world rankings of country size by area, and sits directly below Iran and Mongolia, and right above Chad and Niger. As of 2017, Peru is listed as having the 43rd largest population in the world, placed between Venezuela (#42) Uzbekistan (#44).